Northants Men produced a brilliant late fightback to claim a thrilling 117-113 Liberty Trophy win over Leicestershire at Wellingborough BC. 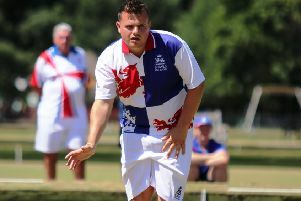 In the most prestigious of all the national competitions, the Liberty Trophy is a competition which the County won for the first time in 2015, and both they and Leicestershire were semi-finalists last year. It was expected to be a tight contest, and that is exactly what transpired. The lead was generally in Leicestershire’s favour for the majority of the match, but the last few ends saw a very good upsurge of fortune for Northants, and in taking 17 shots to just seven conceded in the last two ends across the six rinks, the deficit was turned into a great victory. The County had four winning rinks and two losing, with the highest scoring of the County’s winners being that skipped by Connor Cinato that posted a 23-17 win. Northants will now travel to play Warwickshire in the next round on Saturday, December 16. NORTHANTS Ladies were beaten 130-104 by Leicestershire in the Atherley Trophy at Barwell IBC. The County found their opposition too strong, apart from the one winning rink, and that skipped by Joan Watts, which scored a very impressive win by 22 shots, which reduced the overall losing margin for the County. The first quarter of the match was pretty even, and after around four or five ends played by each rink, the County had a small lead at 24-19. But it was not long before that lead was changed in their favour by the home team, for after 10 ends of play it was 56-53 and that lead gradually grew to the end, with a 13 shots lead after 15 ends, and a 28 shots lead after 18 ends. The last three ends across the whole team did see the County outscore Leicestershire 15-13, but it was too little too late. THERE was a big win for Northants Over-60s as they beat Hertfordshire 128-99 in their inter-county competition clash. This competition is played with three rinks at home and three rinks away. The County’s home rinks were at Wellingborough BC and the away rinks at Watford IBC, with both venues providing two winning rinks and one losing rink for Northants. and the Watford three rinks won 63-52, with the highest scoring rink skipped by Jim McKee. NORTHANTS Men enjoyed a handsome 156-74 win over Northants Ladies in their annual challenge match at Northampton & District IBA. The men had five winning rinks and one losing, and that by just one shot. The highest scoring rink for the men was that skipped by George Warren, with an advantage of 28 shots, but not far behind was that skipped by Terry James that recorded a 21 shots win. The sole winning rink by the ladies was that skipped by Joyce Porter. NORTHANTS Ladies travelled to Desborough IBC for a friendly match, and scored a huge win by 107 shots, seeing off their hosts 182-75. The County won on all six rinks, with the highest scoring being those skipped by Yvonne McKee and Joan Watts, both having 27 shots wins. THE following players have been selected to represent Northants Men for a friendly against Cambridgeshire next Tuesday (Nov 7) at St Neots & District IBC. KINGSTHORPE mixed team were 115-64 winners over Kettering Lodge in the Egham Trophy, which is a national inter-club competition for four rinks, two playing away and two playing at home. Northampton & District were beaten in their clash with Desborough, going down 99-62.